Jane Goodall is the world's foremost authority on chimpanzees. An internationally renowned conservationist, she is the founder of the Jane Goodall Institute and has received many distinguished awards in science. 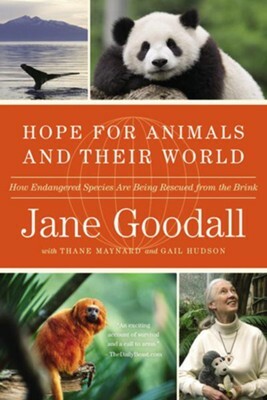 Dr. Goodall is also the author of many acclaimed books, including the bestseller Reason for Hope. With the resurgence of red wolves and California condors, there is good news on the species front, as chronicled in this collection of success stories by renowned chimp researcher Goodall. Section one recounts the revival of six mammal and bird species, including Mongolian miniature horses and Australian wallabies, that became extinct in the wild but are being reintroduced to their natural habitat through captive breeding. Section two describes efforts to bring species back from near extinction, among them Brazils golden lion tamarin and the North American whooping crane. Section three details continuing efforts to preserve 11 species, including the giant pandas of China, whose bamboo diet is disappearing, and the Asian vultures of India, whose disastrous population dropfrom a reported 87 million birds to 27 breeding pairs in 2006has led to a dramatic rise in disease incubated by putrefying cattle carcasses once scavenged by the carrion-loving birds. Goodall is no Pollyanna about species reclamationshe acknowledges that there have been more losses than gainsbut these accounts of conservation success are inspirational. (Sept. 2) Copyright 2009 Reed Business Information. I'm the author/artist and I want to review Hope for Animals and Their World: How Endangered Species Are Being Rescued from the Brink - eBook.